Come in, get pampered, and feel fabulous! From the moment you walk in and we bring you your choice of a favorite beverage, you can begin to unwind and focus on you for a little while…. Whether you are here for a total transformation, or simply a maintenance touch-up, our warm and talented stylists will ensure you leave Charisma looking fresh and feeling fantastic. Our entire team at Charisma is committed to making you feel great – and it doesn’t stop when your styling is done. We’ll help you stay looking terrific with the top-quality after-style hair care products from Davines, Kevin Murphy, Alterna, Olaplex and Revive. You can rest assured that you will have the best products for your unique needs, to keep your hair looking healthy and beautiful until your next service with us. Complete your new look with a little something from our fashion boutique! We have carefully hand-picked a selection of exclusive shoes, purses, hats, hair accessories and jewellery. Treat yourself to some retail therapy or purchase a gift for someone special! Green Circle Salons is a new company with a mission to make the Canadian industry sustainable by 2020. They are doing this in a way that is affordable, achievable and most importantly, impactful. They believe that over time – and with the help of guests and employees – small steps to transform each salon will make green conversion possible and sustainable. 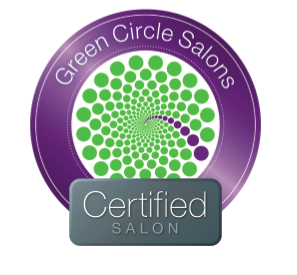 Visit greencirclesalons.ca for more information.